Lt. Governor David Dewhurst was in his element at an event hosted at the King Street Patriots warehouse that featured such notable speakers as Michael Reagan. 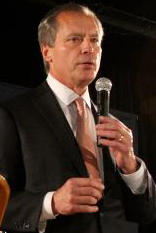 Although Dewhurst's remarks included a number of themes oft repeated by Republican contenders for public office, Dewhurst did provide specific policy proposals targeting spending (especially when answering audience questions), as well as talking at length about how to recapture economic vitality. Repeal ObamaCare. Dewhurst revealed that “we can't fund education if it stays,” creating a true sense of urgency, and emphasizing a real choice between essential government services and optional and unaffordable legislation. Keep America strong. In this segment, Dewhurst touted his veteran status, his service in the CIA, and his knowledge of how to start and grow a new business “from scratch.” In this context, Dewhurst advocated posting 40,000 additional border patrol officers to ensure genuine border security. As Dewhurst explained, he didn't “win any popularity contests” by cutting $14 billion out of state spending or implementing voter ID legislation designed to safeguard the integrity of elections in Texas, a fact which will yield ready agreement from onlookers. Dewhurst has indeed been at the front lines in tackling major issues in Texas. Dewhurst proposed making it possible to “buy insurance across state lines,” but emphasized the necessity of absolutely repealing ObamaCare, specifically the individual mandate. The night was in its entirety an instructive enunciation of Dewhurst's plans as well as his understanding of various problems confronting America. To all who attended, it was enlightening, and should serve to further assist voters in identifying their choice for Senator in this contentious election. *For information on how to get a taping of this event or how to rent the KSP warehouse for an upcoming event - please call 713.401.3550.